Many people that are in the market to purchase a new PC only look at preconfigured systems when shopping. Many of these systems offer great specs for the money, but in the end, the quality of the components is often greatly reduced to decrease manufacturing cost and maximize profits. Most of these systems also come with a lot of junk software that slows them down and is annoying in various ways. Building a PC is actually much easier to do than many other things, and with some patience and research, it can be far more rewarding and less expensive while involving the highest quality components. Knowing what pieces that are necessary to buy is the first step that many people get stumped on. The parts that have to be purchased are a case, motherboard, processor, memory (also know as RAM), video card, power supply, and hard drive. 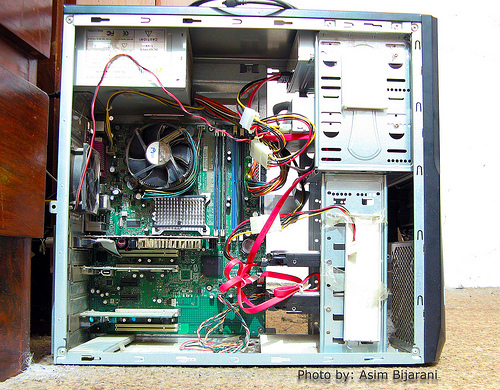 A network and sound card are almost always integrated into the motherboard, but based on which is purchased, this may not be the case and an external one will have to be purchased. Video cards can be integrated too, but if the individual plans to play any games, an external one is absolutely necessary. A DVD drive is always preferred, but with today’s digital distribution of software, it might be completely unnecessary for the individual (they are usually very inexpensive to purchase). Unless the person buys OEM parts, they will almost always include all the screws and cables necessary to hook things up together, but this should be checked on if you have no extra parts or a local computer store to buy them from. It is important to do some research on every single component that the person buys. This can be very easy if purchasing from the right website, since the best sites provide user reviews for every single item. It is good to pay attention mostly to the bad reviews, since this will reflect whether the item commonly dies, has physical issues, or does not include a key feature that comparable products commonly include. Some important details to watch for are the number of RAM slots the motherboard has, the speed (mhz) of the RAM, the speed and interface of the hard drive (SATA is best), and the wattage of the power supply (minimum: 500 watts). As always, it is important to look up benchmarks for the parts that matter the most for the speed of the PC (graphics card and processor). Even though everyone wants to stay on the cutting edge of technology, parts like XENPAK modules and optical transceivers are far beyond the scope of a home PC. Data centers are the only computers that benefit from server-grade components, and these will have no or a negative impact on normal computer software. Fluxlight Inc. – Providing high quality GLC-T modules and Cisco compatible SFP modules since 2004. You can follow me on Twitter, add me to your circle on Google+ or like my Facebook page to keep yourself updated on all the latest of Hardware and Software reviews. This entry was posted in Hardware and tagged buy, card, case, components, computer, drive, external, hard, important, individual, integrated, item, motherboard, parts, PC, power, processor, purchased, quality, ram, research, reviews, software, speed, supply, systems, video. Bookmark the permalink.